Pelleymounters has been trading for over 100 years and is still going strong. We believe the key to our success has been an unrelenting drive to put the customer first, delivering the best products at the best prices. From paint to pergolas we stock an extensive selection of products available to order online for in-store collection, or shipped directly to your door. We are ideal for all round household products, from cookware to gardening and DIY, and if we don't have the item you're after we can always get it for you. Peter took over the first store in Millom in 1972, and since then the company has increased in size to 4 stores, with his son Andrew now working alongside him. In 1980 Peter established a further store in Seascale based on the same values and qualities that had made the Millom store a success. In 1985 this was repeated with a 3rd store, this time in Egremont, followed by a store in Ulverston in the early 1990s. Our customers choose Pelleymounters Hardware over the larger chains because we can often provide a more competitive price and a better understanding of our customers needs. Why not visit us today in store or online to see for yourself why we have earned a reputation for always putting our customers first. We now offer an instore click and collect service, where you can reserve your items online for collection in one of our four stores. 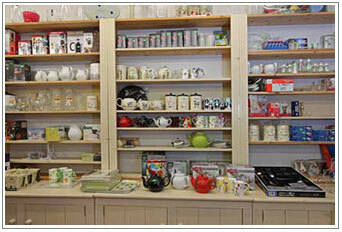 We also offer nationwide next day delivery for all of our instore items and cookware. At Pelleymounters we are always looking for ways to braoden our product range to give our cutomers the widest possible choice at the best price.